For a gathering with wine buddies Tom R and Don K, me doing a little cellar thinning to source a couple of cases of wine for Don's cellar, we held a wine tasting dinner featuring a Napa Cab 2004 horizontal along side a couple diverse wines. Adding to the special occasion was son Alec being in town from NYC to join us. Don presented me with a special select bottle of Dunn Howell Mountain 2010. Tom brought an Antinori Tignanello 1999 for our Italian dinner. I pulled a Del Dotto Cabernet Franc 1997 and a Fantesca Spring Mountain Cabernet Sauvignon 2004 for the occasion. Before dinner we tasted a Clark Claudon Napa Valley Howell Mountain 2004 and a Robert Craig Affinity 2004 from 375ml half bottles with artisan cheeses - aged Maytag blue, fresh Parmesan and my favored Bellavitano. We dined at Angeli's Italian our favorite local neighborhood trattoria. Don chose the Veal Piccatta, Tom the Veal Saltimboca, Alec the Ravioli and I chose their spaghetti with Bolognese sauce with a veal meatball and italian sausage. Prior to dinner we feasted on a selection of their superb appetizer courses to accompany our wines, Angeli's spectacular steamed mussels in white wine sauce, fried artichoke hearts, grilled calimari and their sinfully decadent butternut squash gnocchi, potato dumplings stuffed with butternut squash served in a sweet brown sugar cream sauce. Don and I shared the always outstanding 'Angelis' Special' salad; Baby Sprig Lettuce with Caramelized Walnuts, Blue Cheese, Apples and Pear Slices with a Sweet Raspberry Dressing. Robert Craig produces this blend of Napa Valley Cabernets from his various vineyard sources on Mt Veeder, Howell Mtn and Napa Valley. He also sources fruit from Mt George and Spring Mtn distict for his wines. He calls Affinity 'three mountains and a valley cabernet'. Its produced for early enjoyment but we continue to find it ages well too. Like the Del Dotto and Clark Claudon wines, we continue to hold a vertical of this wine dating back to the inaugural 1993 vintage. This is the second tasting of this label this week. This ten year old 2004 remains consistent with earlier tasting notes, deep dark purple inky color, the ripe berry fruit aromatics, full body, ripe berry fruit, accented by a undercurrent of caramel are starting to give way to a layer of anise, tobacco, leather and firm full tannins on the long fruit filled finish. Tasted from a 375 ml split. In this smaller format, this bottle was starting to show its age. I acquired a case of this wine on release back in the late nineties but tonight's bottle had been purchased at auction. I mention this as the cork broke in half while opening, and then the wine had a slight discoloration and a slight barnyard funkiness upon opening. These may be indicators of less than appropriate or imperfect provenance, or signs of aging. I lasted tasted this from the cellar a year ago and prior to that it was almost three years to the day back in 2011. I'll pay special attention next time I open an original vintage bottle from my collection. That 2011 tasting note stated, "The Del Dotto Cabernet Franc 1997 was opaque garnet colored, medium bodied and opened with a earthy leather revealing its age, turning to black cherry, spice and a hint of tobacco (RM 90, WS 91 points)." Perhaps tonight's experience was a continuation of that aging as this approaches the end of its (prime) drinking window. If that is the case then its time to drink up. My tasting notes from a year ago though cites the same dark ruby color, medium to full body, but emphasizes the spicy black berry and black currant fruits are still vibrant in this sixteen year old, accented by tones of cedar and tobacco with hints of anise and leather on the smooth tannin finish. Same tasting profile other than the apparent effects of aging, or poor handling. In any event, tonight's diminution of fruit and slight funkiness rendered a reduced score of 86 points. Tom brought this classic Super-Tuscan from his cellar sourced from my cellar, from the same lot in my cellar that I took to our Italian tasting last winter. We have fun with this citing a memorable dining experience years ago when dining at Tomaso's in Tempe they were offing this label at below retail and I tried to buy (or drink) their entire stock. 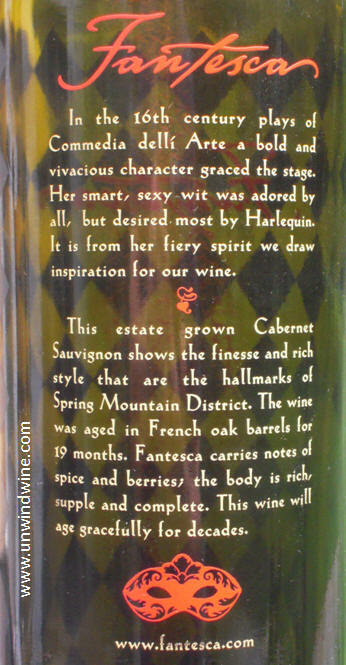 This is a Sangiovese based blend consisting of 80% Sangiovese, 15% Cabernet Sauvignon, 5% Cabernet Franc. 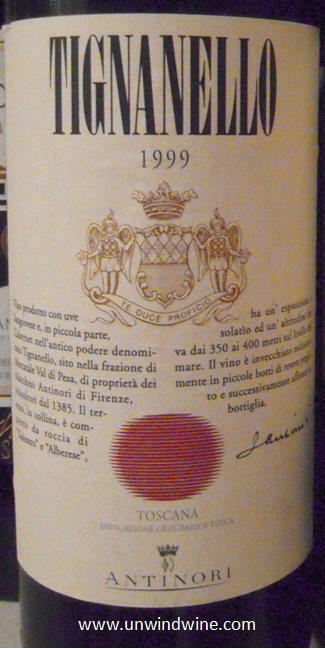 This wine kicked off the 'Super-Tuscan' style back in the seventies which rose to prominence in the eighties. It is produced exclusively from it's namesake Tignanello Vineyard, 116 southwest-facing acres sitting at about 1200 feet elevation at Antinori's Tignanello Estate. According to Antinori, "It was the first Sangiovese to be aged in small oak barrels, the first red wine in modern times to use a non-traditional grape variety, Cabernet, in the blend, and among the first red wines made in Chianti with no white grapes." In all three instances, it set the example for a new breed of exceptional top-of-the-line Italian wine. It first was released under the Tignanello label with the 1971 when the wine became a Vino da Tavola della Toscana. Deep Ruby colored, huge floral bouquet, medium-full bodied, forward bright vibrant mouthful of black cherry predominates with notes of currant, spice, and hints of tobacco and leather on a lingering silky tannin finish. That evening against a flight of Italian wines this showed well and received RM 92 points. Tonight against the Napa Cabs, it presented more modest fruit and appeared to be a bit flabby rendering a reduced score of RM 88 points. Perhaps its not a fair fight to stand this Sangiovese based blend up against a Napa Valley Cabernet Sauvignon. My notes from a earlier similar tasting back in 2003 reflected the same state of being overshadowed by a bolder bigger and more fruit forward Napa Cab. 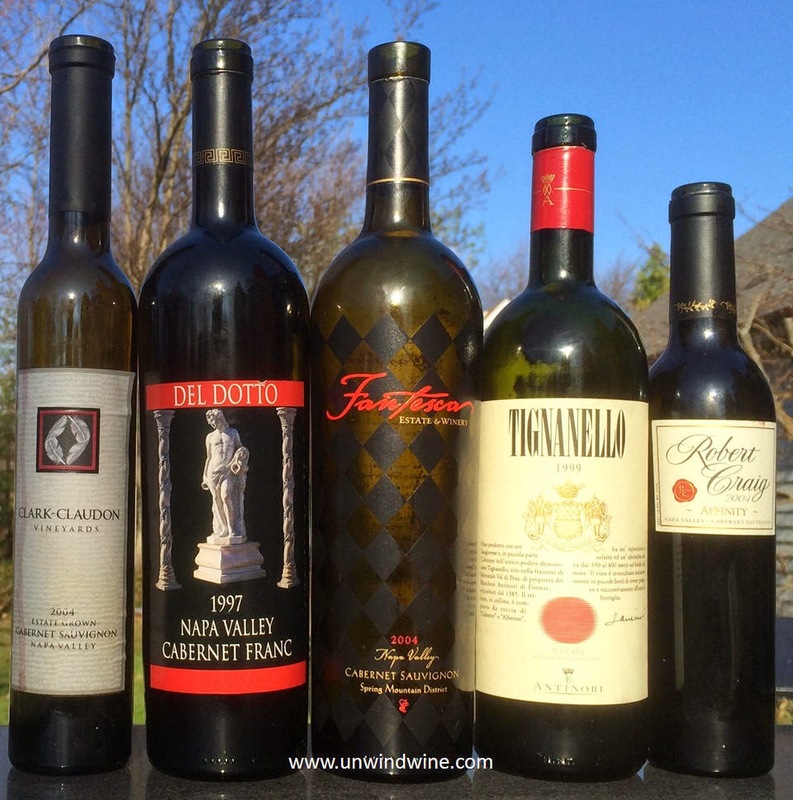 "Antinori Tignanello Toscana 1999 was totally overshadowed and blown away by the breadth and depth of the Elan (Napa Valley Cabernet) - so much so I'll hold off notes until the next tasting." To compare against the two '04 Napa Cabernets tasting earlier we took to dinner this 2004 Fantesca Napa Cab. We visited Duane and Susan Hoff and their spectacular mountainside estate of Fantesca Spring Mountain Estate and Winery during our Napa Wine Experiences in 2007 and in 2009. With their elegant etched glass bottles, we enjoy serving this wine at special occasions, and we love their sophisticated and elegant wines too. This was the first vintage release under their ownership. 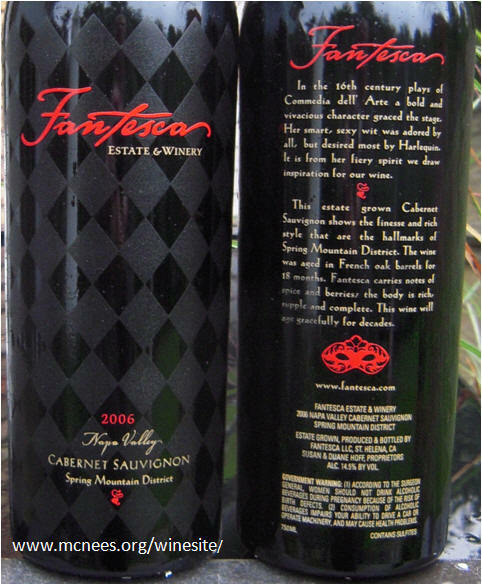 Returning to the '04 Cabernet, the Fantesca was medium-full bodied, dark garnet colored, complex but smooth and polished with bright forward fruits of black currant, dark berry and black cherry, accented by sweet dark chocolate, a hint of cassis, and a tone of spice on the lingering refined tannin finish.